*At the end of the day at work on Thursday, I was talking to Tori Sheppard and Erin Schneider Stevenson. Erin mentioned she was going to attend the St. Regis Flea Market in St. Regis, Montana this upcoming weekend. I thought that sounded like a great idea, so I went home and asked Paul if he would like to go on Saturday. We have been looking for funky items to put in our gardens in the backyard, and this might be just the place to find some. We also asked Debbie and Christy if they wanted to go with us. Christy said no, but Debbie said yes. So we picked Debbie up about 9 a.m. and headed for St. Regis. 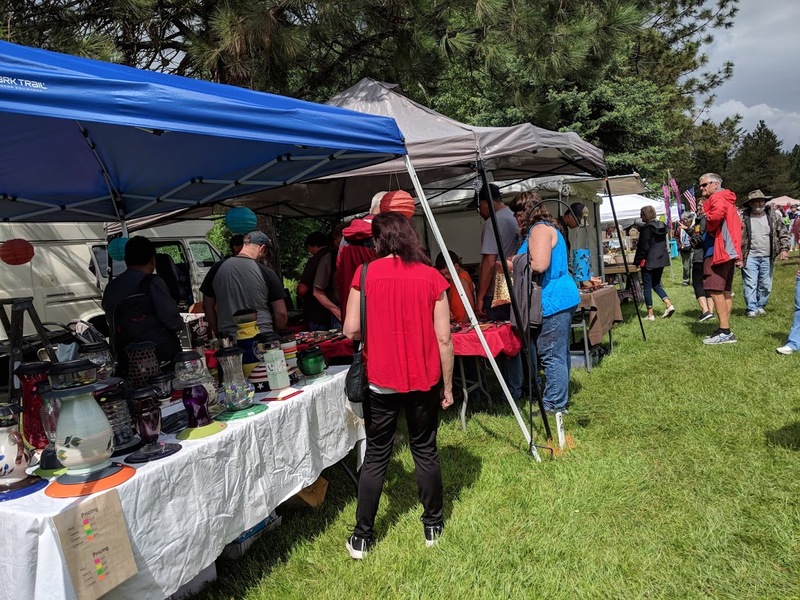 *It was a rainy drive over, but once we arrived, the weather was cloudy and cool as we walked around and looked a the various tables and booths with a variety of items. Erin told me I would see all kinds of people I know from the valley, and she was right!! I saw Jo Bluhaunka, ChuckandBobbie Donnenwirth, Peggy Figueroa, Nita Buhl and Steve Davis, Charles and Karin Clark, Colleen and Ted Pettis, and Casey Duncan, to name a few. An owl getting ready to deliver a message...let's hope it is not a Howler!! A flower for Christy's yard. Debbie's perfect find for her kitchen!! *We invited Christy, Everett, Bill and Debbie over for a garden tour and party later in the afternoon so show them the work we have been doing on the yard. We had a wonderful time showing them around the yard, and showing them the changes, and enjoying our beautiful place. I threw together some snacks and opened some wine, and we had a wonderful, relaxing afternoon together. *Bill had somewhere to be, Christy and Everett had to go home, but Debbie stayed, and was here when Molly and Travis arrived to spend the night. Paul showed them around the garden and they got the official tour. Before you know, I had whipped up a turkey meatloaf, Greek salad and watermelon for dinner, so we all enjoyed a nice meal.